Richland Newhope/Richland County Board of Developmental Disabilities (RCBDD) is celebrating Developmental Disabilities Awareness Month in March. Statewide, and across the nation, organizations devoted to serving individuals with developmental disabilities are holding special events to raise public awareness of the many abilities people have, regardless of their disability. 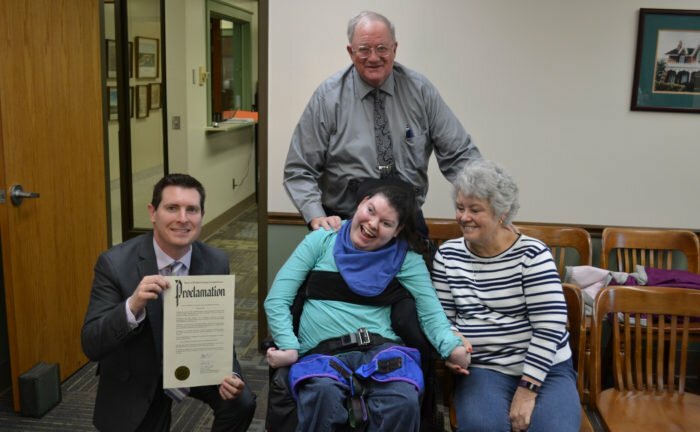 Richland Newhope kicked off its recognition of March as Developmental Disabilities Awareness Month during the February 28 regular meeting of the Richland County commissioners. A proclamation presented by the commissioners is one of 10 to be issued in recognition of the month-long observance. Among those on hand for the kickoff were Heidi C., an individual who receives supports from Richland Newhope, and her guardian, Linda Pfizenmayer. March activities include the 26th Annual Richland County Third Grade Coloring Contest Awards Luncheon on March 8 at Richland Newhope’s Early Childhood Center, the 18th Annual Community Awareness Day on March 14 at the Richland County Longview Center and several other locations, a booth at the Richland Area Chamber’s Business Expo on March 21, and the 2nd Annual Step Into Spring – a free fun walk on March 29 at the Richland Mall. The walk is being held in conjunction with Richland Public Health, Richland County Children Services, the Mansfield Y, and the Richland Mall. Other activities to mark Developmental Disabilities Awareness Month include displays at the main branch of the Mansfield-Richland County Public Library and the Richland Mall, five billboards, and the distribution of more than 6,000 pamphlets to 67 Richland County churches. In 2018, the Richland County Board of Developmental Disabilities (Richland Newhope) served more than 1,600 individuals through early intervention, preschool, transition services, supported employment, residential, therapy, and other family support programs.